Yup! It is exactly what this title is talking about! Click ze picture to go to the Mountain Project route website, mkay? Fart jokes are always funny. And so are pooping stories. I bet my friends have a few they could share! And so they did. And here they are. “Enjoy”! It was on a climbing trip to Foster Falls in October 2013. My girlfriend and I had been climbing with our friends all day, and everyone wanted to get one last send under their belts. I had been feeling a little uneasy below my belt for part of the day. Some of us wanted to send this sweet looking 5.10a, and I agreed to clean the route if someone would set it. With only one person left to climb, it hit me. I excused myself and scurried down the 45 degree angle mountain in my Chacos, grabbing leaves as I went and forgetting to check if they were littered with chiggers. Once I was out of sight with a handful of leaves, I found a perfect area with three trees lying on the ground forming a triangle. I jumped into the center, dug a quick little cat hotel, and upon standing up, I noticed I made a terrible error. I was standing in the middle of a thorn bush! Since I was about to burst at the seams, I carefully lowered my pants and made sure my junk and rear stayed clear of those thorns. Holding onto a tree and leaning back, I let it go and experienced a slice of Heaven. After cleaning myself with the leaves I had collected on the way down, I made my way back to the trail, jumped on Premarital Drilling (5.10a), and flashed that sucker! After the euphoria of sending my first 5.10a had passed, I realized something. My rear end wasn’t accustomed to such a rough texture, and I had the worst pain back there for a couple days after. Oh well. At least I got the send! You can Poop in Slot Canyons, Right? Someone caption this for me down in the comments! This past October I hiked Buckskin Gulch in southern Utah with Joshua and a few others. During this 22 mile hike, you are in a gorgeous slot canyon the majority of the time. Because of the fragile ecosystems of these canyons, hikers are given bags that look like they are from outerspace. No seriously, they look like a weather balloon! Our group had taken a few with the hopes of never having to use them. Fast forward about 15 miles and 6 or so hours, and I was feeling the need to move faster because I didn’t want to use one of those dang bags! Cue canyon floor becoming a river up to my ankles or even knees and our progress slowed. Somewhere around mile 18 I was in pain. Joshua asked what was wrong, and I clued him in that I might need one of those weather balloons. I was hoping to make it past the water area, but ten minutes later I was yelling for a bag…in complete darkness…on a rocky shoulder of said creek. Teetering with my headlamp to navigate parts of the process, I opened the shiny silver bag to expose the garbage bag that I would have to do my business in, followed by tying it off and having to shove it all back into the silver bag, to then close in much the same fashion as a Ziploc. 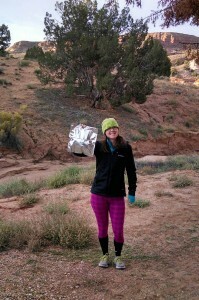 Turning my headlamp off, I did the deed and then quickly realized I then had to carry said bag for the remaining miles. Which I did. It was possibly my most satisfying poop ever! I started climbing Mt Olympus in the Wasatch front near Salt Lake City, UT very early in the morning. During the last few hundred foot scramble to the summit, I realized I had made a huge mistake. I forgot to do my deed back at the house in my early morning stupor and would soon need to poop. Once at the summit, I checked my pack for my wipes and pack-out bag and made the horrifying discovery: I had forgotten both! After some pondering of my plight, I formulated a plan. I would descend the backside of the mountain and loop back around to the trail after finishing my business. I tore a few blank sheets from the summit registry (thank goodness for those pages) and headed down. I found a spot with adequate coverage, dug a good hole, and went about my business. No sooner had I begun than I started hearing approaching voices. Now I was really in trouble! I had to finish up and quick! Seconds before the voices came into view, I buried my little pit toilet and tried to look natural. Why can’t people just use the trail? If there’s one thing we can all learn from this, it’s that pooping outside is one of the best feelings you may ever experience! I guess the consensus here is that pooping outside is pretty fun and awesome. Kristie-Have nice day at school kids, and don’t forget your lunch. How’s that for a caption? This stories were super entertaining. However, I am glad I waited till after lunch to read them. Thanks everyone for sharing your stories. nice David, very nice. i hope to have a poop story featured on your blog someday….. Hilarious post! As Bill Bryson said, “At least then I can say, ‘I *** in the woods'”. My most memorable poop was in the middle of a freezing night in Mongolia; a free range bull came up and was staring at me from a few feet away. I learned that terror loosens the bowels quite nicely!